I was out shopping yesterday and I was tempted to have lunch at Bar-B-Q Plaza, a popular Thai, Japanese-style hot plate barbeque restaurant in this neck of the woods. The mascot of this restaurant is Bar-B-Gon, a dragon-like character and it is obviously a word play of barbeque and dragon. As I was reading the news this morning about the upcoming Windows Server 8 launch, I found out that ever popular, often ridiculed NTFS (NT File System) of Windows will be going away. It will be replaced by Protogon, a codename for the new file system that Microsoft is about to release. Protogon? A word play of prototype and dragon? The new file system, with backward compatibility with NTFS, will be called ReFS or Resilient File System. And the design objectives of what Microsoft calls “next generation” file system are clear and adept to the present day requirements. I notably mentioned present day requirements for a reason, because when I went through the key features of ReFS, the concepts and the ideas are not exactly “next generation“. Many of these features are already present with most storage vendors we know of, but perhaps for the people in the Windows world, these features might sound “next generation” to them. ReFS, to me, is about time. NTFS has been around for a long, long time. It was first known in the wild in the 1993, and gain prominence and wide acceptance in Windows 2000 as the “enterprise-ready” file system. Indeed it was, because that was the time Microsoft Windows started its dominance into the data centers when the Unix vendors were still bickering about their version of open standards. Active Directory (AD) and NTFS were the 2 key technologies that slowly, but surely, removed Unix’s strengths in the data centers. But over the years, as the storage networking technologies like SAN and NAS were developing and maturing, I see the NTFS being little developed to meet the strengths of these storage networking technologies and relevant protocols in the data world. When I did a little bit of system administration on Windows (2000, 2003 notably), I could feel that NTFS was developed with direct-attached storage (DAS) or internal disks in mind. Definitely not full taking advantage of the strengths of Fibre Channel or iSCSI SAN. It was only in Windows Server 2008, that I felt Microsoft finally had enough pussyfooting with SAN and NAS, and introduced a more decent disk storage management that incorporates features that works well natively with SAN. Now, Microsoft can no longer sit quietly without acknowledging the need to build enterprise-ready technologies related to storage networking and data management. And the core in the new Microsoft Windows Server 8 engine for that is the ReFS. Ability to isolate fault and perform data salvation on parts of the file system without taking the entire file system or volume offline. The goal of REFS here is to be ONLINE and serving data all the time! Optional integrity streams that ensures protection for all forms of file-level data corruption. When enabled, whenever a file is changed, the modified copy is written to a different area of the disk than that of the original file. This way, even if the write operation is interrupted and the modified file is lost, the original file is still intact. (Doesn’t this sounds like COW with snapshots?) When combined with Storage Spaces (we will talk about this later), which can store a copy of all files in a storage array on more than one physical disk, ReFS gives Windows a way to automatically find and open an uncorrupted version of a file In the event that a file on one of the physical disks becomes corrupted. Microsoft does not recommend integrity streams for applications or systems with a specific type of storage layout or applications which want better control in the disk storage, for example databases. Data scrubbing for latent disk errors. There is an tool, integrity.exe which runs and manages the data scrubbing and integrity policies. The file attribute, FILE_ATTRIBUTE_NO_SCRUB_DATA, will allow certain applications to skip this options and have these applications control integrity policies beyond what ReFS has to offer. Protection against bit rot. Silent data corruption, which I have blogged about many, many moons ago. End-to-end resilient architecture is the goal in mind. ReFS uses B+ trees for all on-disk structures including metadata and file data. 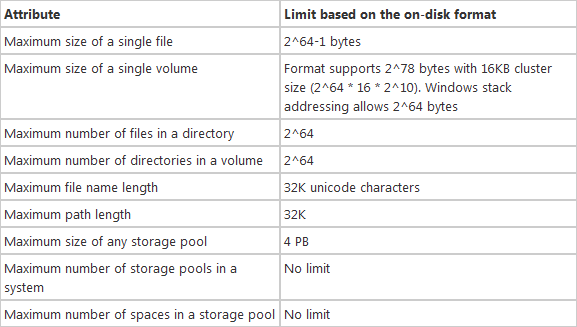 The file size, total volume size, number of files in a directory and number of directories in a volume are limited by 64-bit numbers, which translates to maximum file size of 16 Exbibytes, maximum volume size of 1 Yobibyte (with 64 KB clusters), which allows large scalability with no practical limits on file and directory size (hardware restrictions still apply). Metadata and file data are organized into tables similar to relational database. Free space is counted by a hierarchal allocator which includes three separate tables for large, medium, and small chunks. File names and file paths are each limited to a 32 KB Unicode text string. And similar to this “flexible volume management” ala ONTAP FlexVol and ZFS file systems, you can add disk drives on the fly, and grow your volumes online and real time. ReFS inherits many of the NTFS features as it inches towards the Windows Server 8 launch date. Some of the features mentioned were the BitLocker encryption, Access Control List (ACL) for security (naturally), Symbolic Links, Volume Snapshots, File IDs and Opportunistic Locking (Oplocks). ReFS new technology will certainly bring Windows to the stringent availability and performance requirements of modern day file systems, but the storage networking world is also evolving into the cloud computing space. Object-based file systems are also getting involved as market trends dictate new requirements and file systems, in order to survive, must continue to evolve.